OK, the Doordarshan generations promise me you will not think about the Liril girl while reading this post on Ethipothala Waterfalls near Nagarjuna Sagar Dam, and non-Doordarshan generations please do not Google it. Damn, just you won’t listen to me. Well, I can’t blame you for a generation or two of Indians the waterfalls are synonymous with Liril Girl Karen Lunel, who changed the way we take a bath under the waterfalls or dream about it. In reality, it is not all that glamorous and actually very tough to take a bath under a waterfall with all the algae, leeches, slippery and sharp rocks and a thousand bystanders and their uncles watching you. (this was 30+ years ago). (A bearded guy with wings and halo suddenly appears behind my shoulders and screams: OYE! Control desi this is a family blog). Me: OH, OK thanks for reminding that. Focus Focus Focus! Should You Swim in The Pool of Ethipothala Waterfalls? How To Reach Ethipothala Falls: The trip should be combined with Nagarjuna Sagar Dam and nearby places, once you cross the dam coming from Hyderabad side continue on the road towards Macherla, drive slow as it is Ghat road and keep on looking for signs for the Ethipothala Waterfalls. About 6 -7 KM on the Macherla road on the left side you will see a board announcing the falls. There will be a boom barrier on the small road manned by a shady guy in saffron he will force you to shell out 15 Rs, for some kind of tax. You can choose to pay him and save some time, or you can choose to argue with him for half an hour and then pay, you see life is all about choices. We chose the first option and continued towards the Ethipothala waterfalls. Total distance to Ethipothala Waterfalls from Hyderabad is about 193 KM, and you will have to cross the Nagarjuna Sagar Dam to reach the falls. Best Time to Visit Ethipothala Waterfalls: During and after the monsoons from July to February when there is ample water in the waterfalls. At the parking lot near the Ethipothala falls some local lads wanted protection money to protect my car from the local langurs ( monkeys) for a ransom of 40 Rs. As the car is still on a loan from the bank and I was pretty sure they will not understand the brotherhood of langurs and local lads so I bargained for Rs 10 (the things I do for peaceful travel) silently wishing in my heart that none of them ever gets a hoor. The Ethipothala waterfalls are well-managed by APTDC and there is an entry ticket for humans, the langurs could enter free. Wiki Gyan: Ethipothala Falls is 70 feet high river cascade, situated on the Chandravanka river, a tributary of the River Krishna. The waterfall is a combination of three streams namely Chandravanka Vagu, Nakkala Vagu and Tummala Vagu. We met some students and teachers from Sri Sai Vidyaniketan Mahabubnagar, who were very excited to see my camera and some of them wanted me to click their photos. Their teacher Mr. V Suresh, MBA gave me his email address to send the pictures, which I did once I came back to Hyderabad. You can see some of the students and teachers with the Ethipothala waterfalls here in the pictures. There is a small restaurant and some rooms managed by APTDC next to the falls, where you can stay if you are too keen to move away from civilization for a few days. The waterfalls are illuminated after dark (6:30 pm) but we could not stay for that long and missed the light show of the illuminated waterfalls. 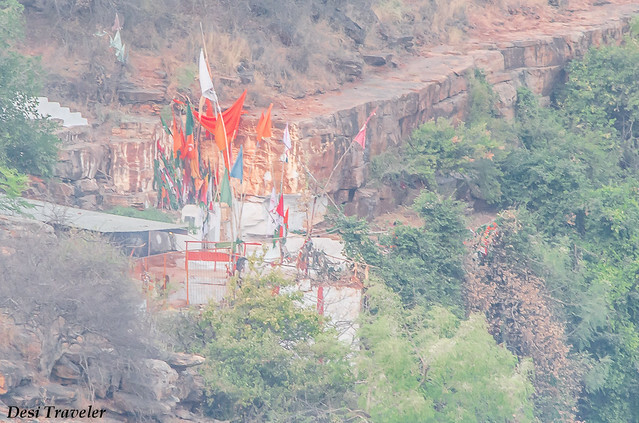 There are two temples one of Ranganatha Swamy and another of Dattatreya near the waterfall, which is very popular with locals. We missed them as we were very tired, but not before clicking some pictures of a family that was going to the temple. Though the temple is of Hindu god Ranganath an incarnation of Vishnu, the pilgrims were carrying green flags normally associated with Islam. I think this is another example of what a multicultural melting point this region is. The car was still in its place and I promptly gave 10 Rs to the local lad who now wanted Rs 100 as he felt I have taken more time than he thought to come back. Now I was furious and said let me click your picture and give to police to trouble tourist, this quickly changed the power play and he promptly accepted 10 Rs and vanished along with his cousins. 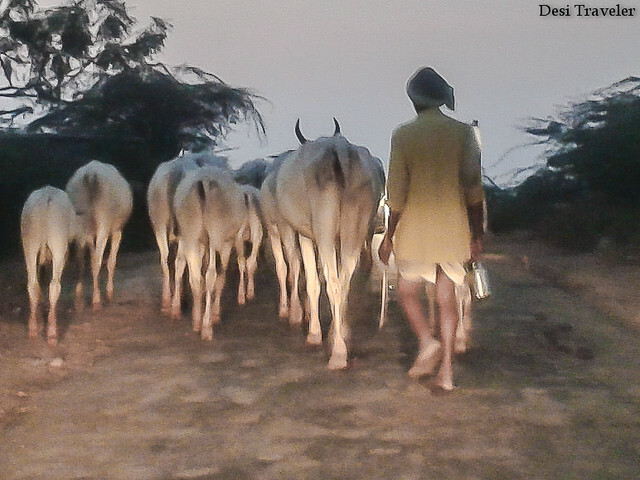 While coming back just before the barricade where the shady guy in saffron sits, a cowherd was returning home with tens of cows, causing a huge traffic jam with his wealth spread all over the road. So here we were in the middle of a narrow road with cows in front of us and the light from our car and the light from the car in front of the cows creating a very dramatic effect. I had already packed my Nikon but the cell phone did a pretty decent job in catching the mood of the evening in this picture. What do you say? 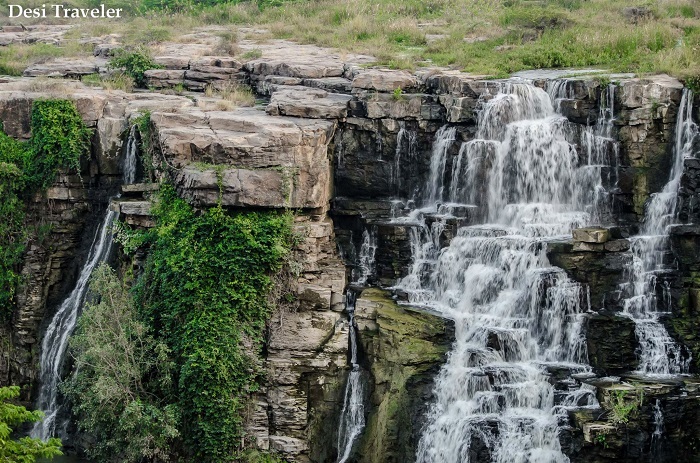 Overall I would say Ethipothala waterfalls is a must visit if you are going to Nagarjuna Sagar. Best time to visit Ethipothala Waterfalls is after Monsoons when the falls are overflowing with water. 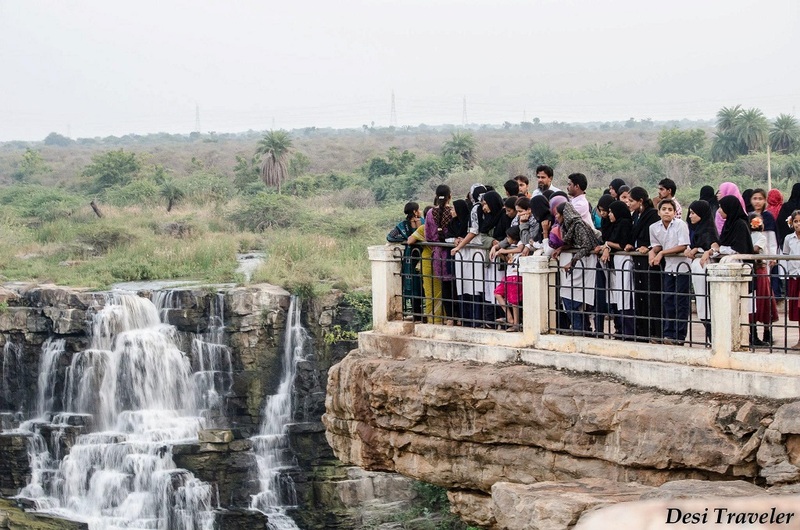 But for some fun family time Hyderabad folks can visit the falls anytime of year. I’m planning for a one day visit to nagarjun sagar dam along with this water fall..but basically i want to have some fun in water is it possible here. 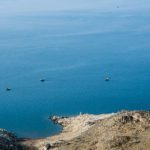 You can go for a boat ride in the Nagarjuna Sagar for the Nagarjunakonda Buddhist Museum and also do some fun Coracle rides in the Nagarjuna Sagar Reservoir waters. Very well documented blog Mr Prasad. Loved the pictures laced with humour. Being co-located in Hyderabad, perhaps we can meet up sometime. Even do an outing together! God bless. Is it the place to Just look at the views or can we take shower too ?? Any place nearby for the stay and food ?? The answers are in the post.. there are crocodiles in the waters so if you can fight with crocodiles feel free to take a plunge in the waterfalls and yes there is a hotel at the falls and also at Nagarjuna Sagar – Haritha Hotel where you can stay. 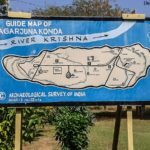 Hi Desi Traveller, Nice Discription of Nagarjunasagar Site Seeing. I think 1 day is enough for the trip. A lot of people do it as a day trip, but with kids I suggest you stay there overnight so that they can enjoy otherwise it becomes very hectic for them. Depends you are traveling with friends or kids. 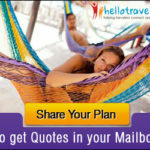 I am planning a 2 day trip in begining of April from Hyderabad. Do you think Ethipothala falls will be a good idea in that season? Also, can you suggest other places for a 2 day trip in this region? Thanks! 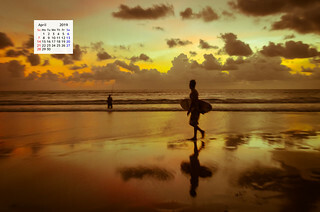 Hi Mahima: I am traveling at the moment, so can not answer in detail. April water level will be low. Overall the Description about the waterfalls and trip is SUPERB. Except for the thing you pointed out about Telangana…….why you people hate seemandhra PEOPLE????? i am not going to talk about politicians or Realtors….i am talking about the remaining 99% of the common people in seemandhra…whats wrong they have done to you people???? If you have anything to hate…just hate politicians,Not the common people. Hi B: Thanks for liking the description of the waterfalls. Hi Vikas: Thanks for your kind words. The hotel at Ethipothala is very basic with power issues. The one at Nagarjuana Sagar is better and is right at the Dam reservoir. You can see the Nagarjuna Sagar from your hotel room. From the Haritha Vijay Vihar hotel to the Ethipothala Waterfalls it is about 7 KM. I have written a whole series on the same you can check the other articles for more details. Thanks. Last week we have visited Ethipothala water falls with our college friends. we thought to have fun with our memories and Bachievements. It’s very nice place with low crowd. but it’s a painful trip for us, unfortunately Haritha Vihar made it disaster for us. Haritha is running on 12 hour power cut without generator on summer!!!!!!!! on two days we have slept 3 hours a day due to power cut. very poor maintenance and there is no proper answerable person for inquiries, hospitality is also very poor, I don’t know how many days back they cleaned wash rooms, plumbing work is also very poor. There is no proper purifying system for bathing water, they are just pumping water from water falls!!!!! only wanna inform you that better to stop resort facility or improve maintenance. Hi Naresh… Very sad to hear about your poor experience at Haritha Vijay Vihar, we also had a very bad experience there as I mentioned in my earlier post here about our poor experience of stay at Haritha Vijay Vihar Nagarjuna Sagar. I agree – a visit to waterfalls in India would be a totally different experience. We didn’t have to pay anyone to watch our car and the water is sooo cold you wouldn’t want to even stick a toe in it. Wow! This is one beautiful waterfalls! Never knew AP had such beautiful places to visit! Awesome waterfalls. Would love to visit this someday. Thanks…it is a good place to visit. Natural scene and wonderful snaps…. Wonderful place and good post. Lovely post!! Beautiful images and very humorously written! Wow! a very nice waterfall. Thanks Dheeraj….coming to South will be a good change for you…. 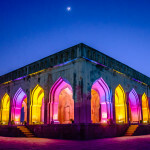 Thnks Manu jee…good place to visit close to Hyderabad.